The third-generation Mercedes-AMG E 63, the most powerful series-production four-door model from AMG to date, is on sale now, priced from £78,935. That gets you the 4Matic+ model - making it more expensive than the current BMW M5, which is priced from £73,985 - while the S 4Matic+ is priced from £88,295 and the range-topping 4Matic+ Edition 1 costs £106,585. First customer deliveries are expected in June. The standard E 63 comes with AMG Ride Control sports suspension, 19in alloys, a Nappa leather interior and split folding rear seats, as well as two 12.3in screens for infotainment and driver display. The E 63 S adds 20in alloys, active dynamic engine mounts, AMG performance seats and a leather steering wheel to that. Edition 1 variants get different black 20in alloys, a new paint finish, some Titanium Grey detailing above the side skirts, and carbonfibre trim inside. A number of different options packs are available. The E 63 S and Edition 1 are avaialable with AMG ceramic brakes for £6996, while an AMG performance exhaust can be added on all models for an extra £1000. The car was revealed at the LA motor show, with Mercedes claiming it offers the biggest step forward in performance for its new models. 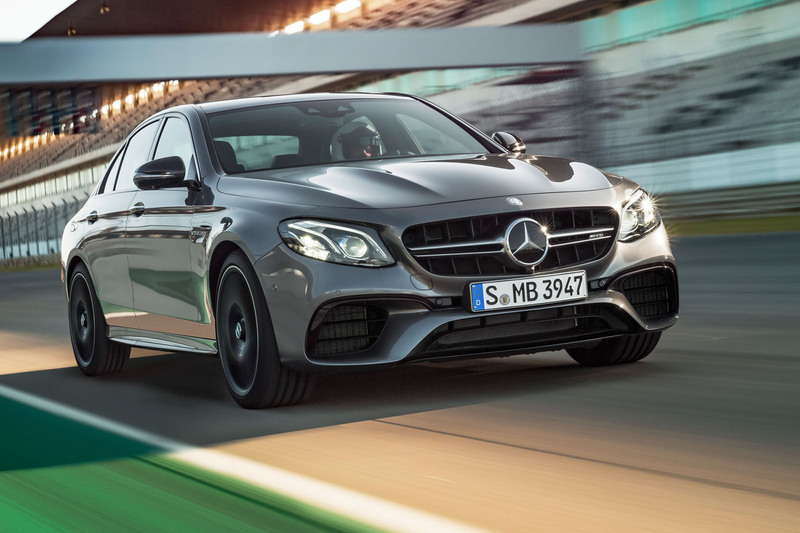 Speaking at the brand's LA press show, Mercedes president and US CEO Dietmar Exler said: "The E 63 is the most powerful car we have produced but it comes with intelligent AMG cylinder management, making it the most efficient AMG. You will pushed to find a car with better power to consumption ratio. "It is the biggest step forward from one generation into the next." Indeed, the new E 63 is the fastest-accelerating model ever produced by Mercedes’s burgeoning performance car division with an official 0-62mph time of 3.4sec in range-topping S 4Matic+ guise. 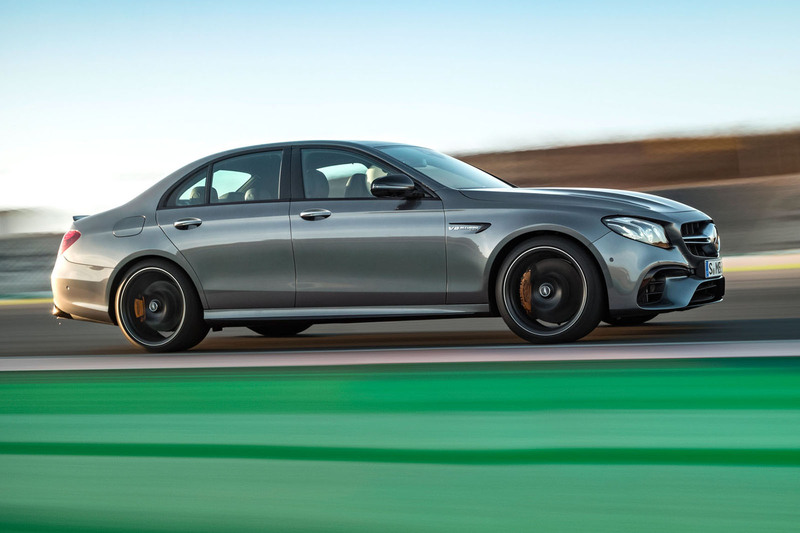 The new E 63 also holds the distinction of being the most powerful series production four-door model from AMG to date. Fitted with AMG’s twin-turbocharged 4.0-litre V8 engine, the new E 63 will continue to be sold in two distinct versions. In standard E 63 4Matic+, it has 563bhp and 552lb ft of torque. The most popular model, however, is expected to be the range- topping E 63 S 4Matic+, which has added turbocharger boost pressure and other power enhancing tweaks, allowing it to produce a stout 603bhp and 626lb ft. The recently unveiled BMW M5 Competition Edition’s twin-turbocharged 4.4-litre V8 engine serves up 592bhp and 516lb ft, while the Audi RS6 Plus’s twin-turbocharged 4.0-litre V8 gets 597bhp and 553lb ft. 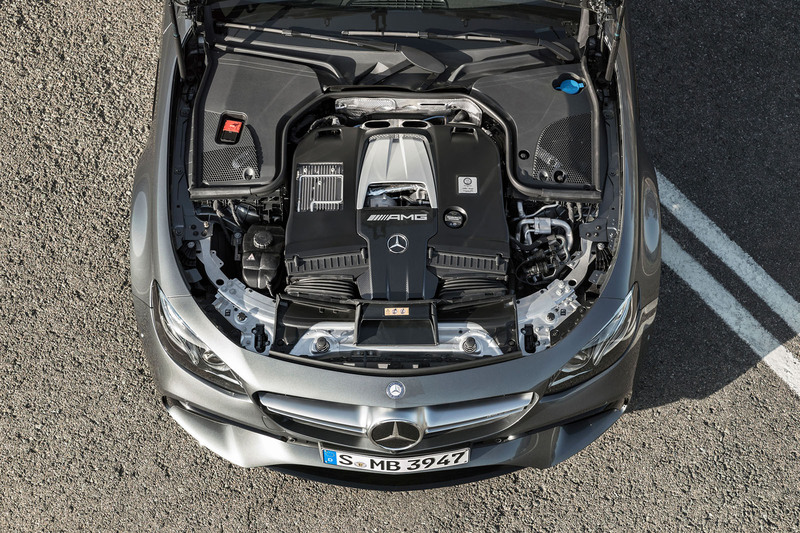 The E 63's new engine, which is mounted on dynamic mounts in the E63 S 4Matic+, replaces the older twin-turbocharged 5.5-litre V8 used in the outgoing second-generation car, providing the standard model with an added 14bhp and 29lb and the S with an extra 26bhp and 37lb ft over its predecessor. For the first time, AMG has fitted its 4.0-litre V8 with a pair of new twin-scroll turbocharger for use in the E 63, which claimedly will improve induction boosting properties and further enhance throttle response. In its most extreme state of tune, as fitted to the E63 S 4Matic+, this new engine develops a specific output of 151.4bhp per litre – some 16.6bhp per litre more than the engine powering the M5 and 2bhp per litre more than the RS6 Performance's engine. This endows the new 1880kg E 63 S 4Matic+ with a power-to-weight ratio of 321bhp per tonne, an improvement of 12bhp per tonne on the old 1865kg E63 S 4Matic it replaces. The engine also has AMG Cylinder Management for added fuel savings on part throttle loads. In city driving, four cylinders are deactivated between 1000 and 3250rpm when the engine is switched to comfort mode. As in other recent AMG models, the driver can choose between four driving modes: Comfort, Sport, Sport Plus and Individual, via a Dynamic Select button on the centre console. In Comfort mode, a coast function decouples the engine from the gearbox on extended periods of trailing throttle at speeds between 37-100mph for better fuel efficiency. A fifth driving mode, Race, is also included on the E63 S 4Matic+. The gearbox in the new E 63 is a nine-speed Speedshift MCT (Multi Clutch Technology) automatic, featuring a so-called wet start off clutch and steering wheel mounted shift paddles. Further driveline developments include a mechanical differential lock for the E63 4Matic+ and faster acting electronic differential lock on the E 63 S 4Matic+. Both models will be available only with AMG's Performance 4Matic+ four-wheel drive system, which offers fully variable distribution of drive between the front and rear wheels for the first time. The E 63 4Matic+'s 0-62mph time is 3.5sec, and the E 63 S 4Matic+'s is 3.4sec. The top speed of both models is limited to 155mph, although buyers can specify an optional AMG Driver’s Package, which extends its maximum potential to a limited 186mph. Despite the use of four-wheel drive, AMG says it has ensured the car retains its reputation for promoting oversteer when the conditions allow through the inclusion of a what it calls Drift mode. Activated by the shift paddles, it prompts the four-wheel drive system to deliver drive exclusively to the rear wheels, remaining engaged until the driver deactivates it. The car's suspension is a specially tuned version of the sixth- generation Mercedes-Benz E-Class’s Air Body Control system, linked to unique tracks widths and wheel carriers. This gives the E 63 greater camber control than its predecessor. The brakes are 360mm discs with six pot calipers up front and 360mm discs with single pot calipers at the rear on the E 63 4Matic+, while the E 63 S 4Matic+ has larger 390mm discs up front. Optional ceramic carbon discs measure 402mm up front and 360mm at the rear. 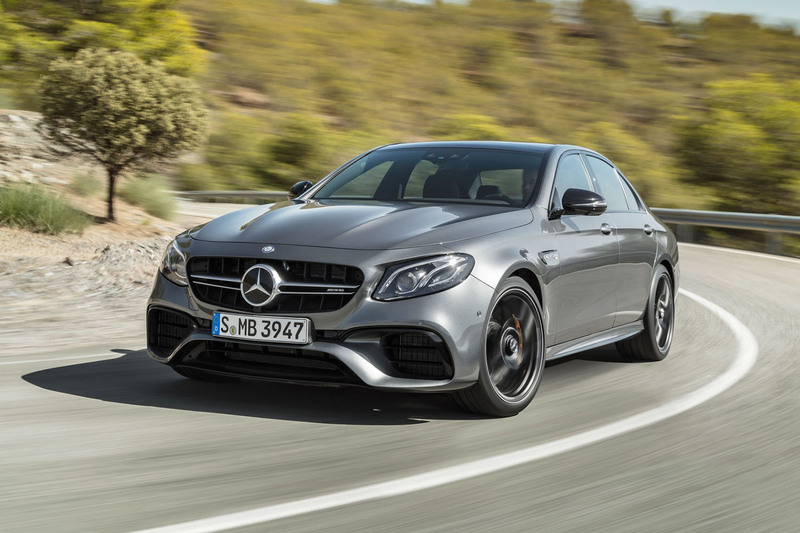 AMG has provided the new E 63 with a comprehensive styling package that not only makes it look sportier but also sets it further apart from regular E-Class models than previous generations of the AMG car. At the car's front, there's a model-specific front grille, bumper, bonnet and fenders. The whell arches extend 17mm beyond those of the standard E-Class to house the E 63's wider front track and 20in wheels shod with 265/35 front and 295/30 tyres (standard on the E63 S 4Matic+ and optional on the E63 4Matic+). The changes up front are combined with black exterior mirror housings, wider sills, a boot deck-mounted spoiler, a new rear bumper and four traditional trapezoidal shaped tailpipes. I know just a stat and Tesla does it also but 3.4s zero to 60 in a near 2 tonne saloon is still seriously fast! The German power struggle continues then. ... owned by Essex nightclub owners and drug dealers. Others are likely to choose something that shouts less loud. Even though Mercedes has got rid of extraneous crease lines on this E class, the way the body panels modulate is still nauseating. I presume MB is going to do their 'UK release' in Pentonville.... so you can both sign the sales contract and book your stay in advance....? I get paid 85 bucks hourly for freelancing. I never thought I can manage to do it but my good friend is making 10000 dollars each month by doing this job and shere commended me to check it out.N#2. I love it! wish they bring that new 4Matic to the C63, or even a new E63 Coupe, would be a great GTR beater,and you can actually get in the back! Over £100k for an E-Class?! Are Mercedes having a laugh?! A car that just looks like a scaled-up C-Class repmobile and is completely devoid of character and specialness and is just a mainstream, dreary and dull German saloon. With the M760i taking BMW over the £100k mark and now this ridiculous price for an E-Class, who says the Germans don't have a sense of humour. What next, £50k for a Golf?! Go mental with factory options on a Golf R and it gets to £46,215, add a few dealer fit accessories and it's a touch over £48K. The stuff they get away with! ...(clonking steering, crabbing, and increased tyre wear as a result - and of course MB's burying of head in the sand over what they now refer to as a "characteristic" on the subject of which new customers will have to sign a waiver when purchasing) I'm relieved I went for a RS6.